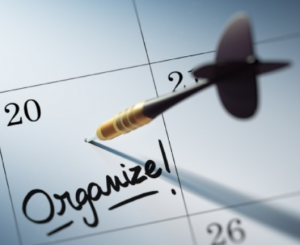 If you are planning to put your house on the market this spring, there is no time like the present to start getting organized for the process of staging, showing and moving out of your home. Begin now by following the ten tips listed below and you won’t feel so overwhelmed when it’s time for that first open house! Eliminate piles before you sell. Some of us suffer from what I like to call flat surface syndrome. If there is a flat surface, it’s covered with “stuff”. Now is the time to eliminate any of the “stuff” cluttering the horizontal surfaces in your home. Things such as mail, magazines and other odds and ends that are piled upon the tops of tables, desks and shelves should be removed. Keeping these spaces clear allows potential buyers to see the space without distractions. Clean out storage areas. If your closets, bookcases, pantry, and other storage areas are overstuffed, this is a red flag for potential buyers that screams, “not enough storage!”. Keeping a minimum number of items in your house will leave the impression that there is a generous amount of storage in your home. Get rid of excess. Eliminate or pack up any surplus items you won’t need before your move. For example, only keep enough dishes, towels, sheets, toys etc.… that you will use during the time your house is for sale. Why have ten sets of sheets in your linen closet when you will only need one or two? Remove extraneous items. Pack away things that are seldom used and seasonal items. This will make your house appear spacious, which is what appeals to potential buyers. Some examples are off-season clothing and shoes, holiday decorations and rarely used kitchen appliances. Throw things away. If something is worn out, broken, rusty, stained, torn or incomplete, it is time to let it go. If your belongings look shabby and old, your house will look that way too. Don’t hesitate to throw such items away. Donate before you sell. When you are cleaning and sorting items, if you come across things you don’t use now and won’t use in your new home, donate them. There is no point in packing and moving something you will never use. But if it’s in good shape, someone else will get use out of it. Sell before you sell. If you find you have a great deal of items to eliminate from your home, think about selling what you don’t store, throw away or donate. You can sell at a yard sale, bring items to a consignment shop or list items online. Remember to have reasonable expectations regarding how much money to charge for used items. Rent a storage unit. Move large items/equipment that you don’t use often to a storage unit. It can also provide space for packed boxes to give you a head start in preparing for your move. Remember that space is a beneficial asset when selling your home. Spruce up outdoor living spaces. Remove any clutter (toys, lawn ornaments, garbage bins) from your yard. The outdoor spaces are usually the first and last impression for potential buyers, so it is important that they look neat and tidy. Hide personal items. Hide as many personal items as you can in drawers and cabinets. For example, place your vacuum cleaner in the utility closet, dish detergent under the sink and your toothbrush in the medicine cabinet. You want as little clutter as possible to make your home more visually appealing and less distracting for potential buyers. Once you get organized, getting your house ready to show will be a breeze!